I just received the newest release, The Devil To Pay, from Kim Simmonds and Savoy Brown and I must say it's really hot! I have been a Kim Simmonds/Savoy Brown fan since high school and I've seen band changes both good and bad. Kim's dedication to keep rocking after 50 years and 45 albums is amazing and a testament to someone who loves what they are doing. Opening with Ain't Got Nobody, Simmonds leads right into a masterful guitar intro, the likes which of I haven't heard since his earlier release like Blue Matter and Looking In. This is a "slow blues" track and Simmonds absolutely blows the lid off right off the bat. The guitar phrasing on this track is some of the most beautifully executed work I have heard in years. Kim... excellent! Like I told you when I last saw you... certainly one of the greatest living blues guitarists today. Bad Weather Brewing is a moderate paced shuffle track with pure raw guitar riffs. Complimented by Pat DeSalvo on bass and Garnet Grimm on drums, this band is cooking. On rocker, Grew Up In The Blues, Simmonds shows continued progress in development of new blues rock riffs. I also want to note that I feel that the overall writing on this release is stronger than on most of the releases in recent years. His constant search for new means of expression and maintaining driving rhythm is exceptional. On shuffle track, When Love Goes Wrong, Kim backs off on the throttle a bit, but still playing smooth articulate guitar riffs. On Oh Rosa, Simmonds breaks out the harp giving the track still another dimension. Simmonds isn't Little Walter but he isn't Bob Dylan either. I really like his style and I think this track is a nice addition to the release. Title track, The Devil To Pay, is an upbeat Jimmie Rogers style blues rocker with a raking guitar rhythm and a natural fluid guitar break. 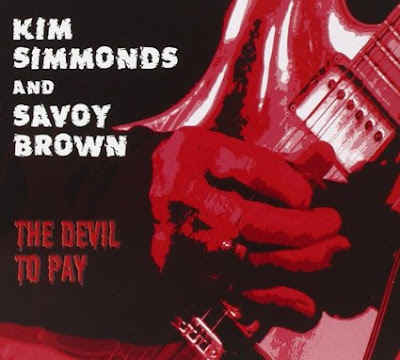 Stop Throwing Your Love Around has a bit of a Willie Dixon flavor and Simmonds does some traditional Savoy Brown improvisational riffs against a traditional blues base. Very nice. Freddie King style, Snakin', shows Simmonds in pure shuffle mode. A real nice guitar instrumental, Snakin' is bound to make it's smooth transition into all blues stations play lists. Got An Awful Feeling finds Simmonds back at his best, choking the crap out of his guitar neck. This guy really does know how to get the best from his guitar and it's always nice to see him show it off. Excellent! Most Simmonds fans know that Kim has always been a slide master and this is the track where he whips it out. His best vocal effort on the release and a solid rock and roller, this track is great! Watch My Woman ventures into swing blues, a place that I've rarely seen Kim and I have to admit it's really nice. Stepping out on guitar, Gatemouth style, seems really natural for Simmonds and a cool change up for the Boogie Master! Whiskey Headed Woman slows down a bit with an almost relaxed, T-Bone Walker kind of style. Up beat accents by Grimm cooks this track and again, Simmonds vocals are some of his best. Want to hear Kim just ride along and play fluid guitar riffs against the up beat...here it is. Very cool! Wrapping the release is rocker, Evil Eye, with it's solid blues roots. Simmonds hits the guitar hard with searing string bending notes and the band drives it home, reminiscent of the conclusion of Hell Bound Train. Hot conclusion for a hot new blues rocker.